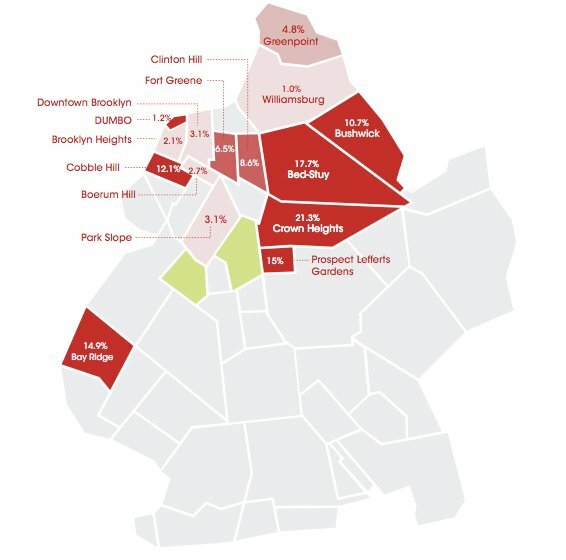 This past week there has been a lot of talk about Crown Heights and Bed-Stuy finally having their “moment”, and it looks like there are numbers in to back that up. MNS‘s June rental market report for Brooklyn and Manhattan reveal that both developers and renters are looking to move away from saturated areas like Williamsburg and DUMBO. By MNS’s measure, average rents in Brooklyn increased from $2,556 to $2,741, or 6.2%, as compared with June of last year — very much driven by rent hikes in gentrifying areas. Manhattan rents on the other hand fell just slightly. Crown Heights, Bed-Stuy, Bay Ridge and Prospect-Lefferts Gardens saw major rental increases, with Crown Heights showing the biggest price jump of 21.3% this year. Studios in the neighborhood are up 36.87%, while one bedrooms have increased 19.59% and two bedrooms 13.57%. 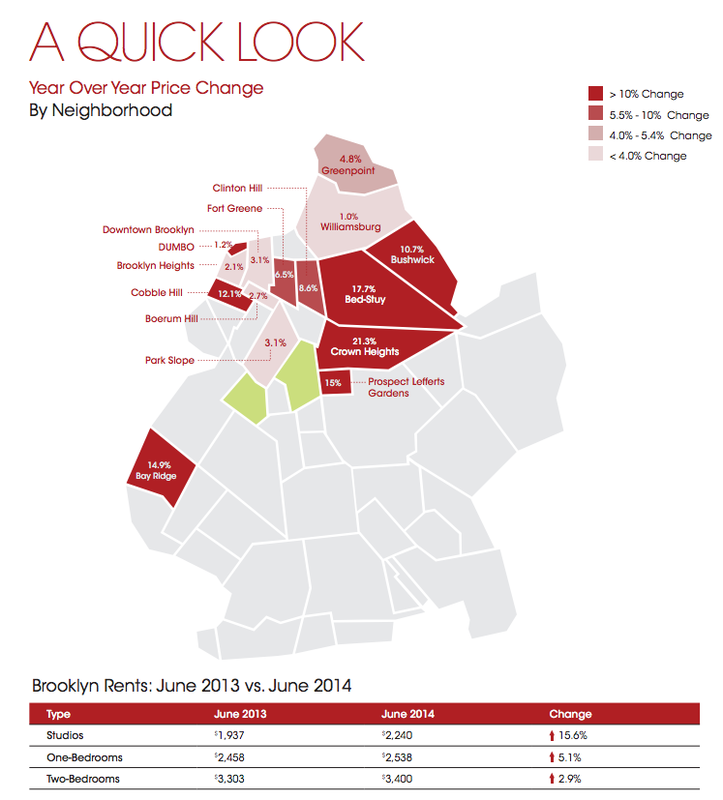 Bed-Stuy saw the second highest change with pricing up 17.7%. Most notably, studio apartments in the neighborhood have risen a staggering 43% since May 2013. These upward trends further reinforce that Crown Heights and Bed-Stuy are the two neighborhoods at the forefront of Brooklyn’s continued gentrifucation. MNS forecasts that we will continue to see these positive pricing trends in the future, especially as urban renewal efforts expand away from the usual suspects, like DUMBO and Williamsburg. In Manhattan, Harlem continues to be a favored neighborhood for renters looking for more space within beautiful quarters. Harlem saw the highest positive year-over-year change for the fifth consecutive month, securing its spot as Manhattan’s rising star. Meanwhile, rents fell by 7% in Gramercy from $3,861 to $3,591 since June 2013 — the biggest drop overall for the island. 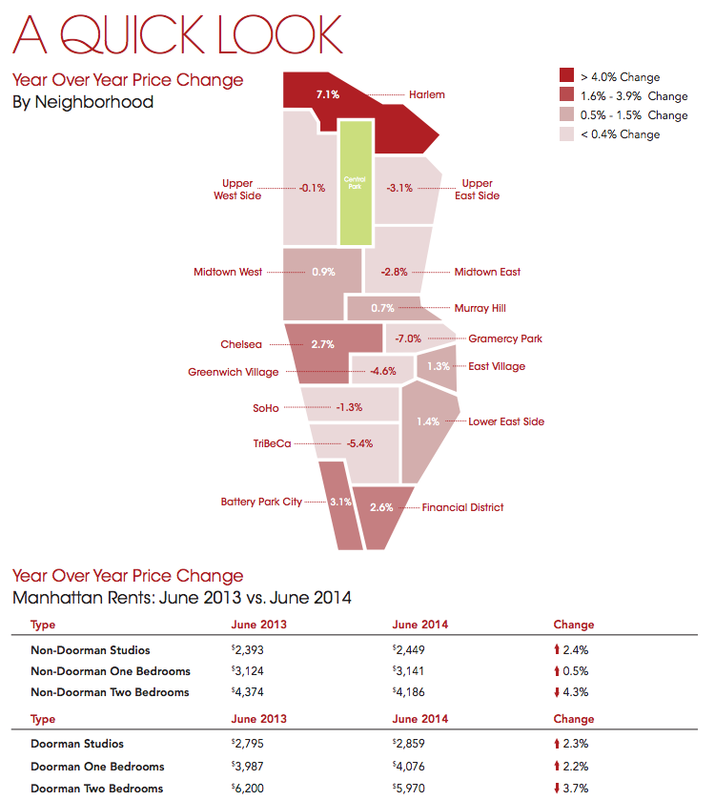 Overall, Manhattan rent prices fell 0.7% from $3,842 to $3,816 compared to June of 2013. Month to month, Tribeca’s average rents decrease significantly due to non-doorman units increasing from 16% to 51%, and the ratio of doorman units decreasing from 84% to 49%, bringing down the average.